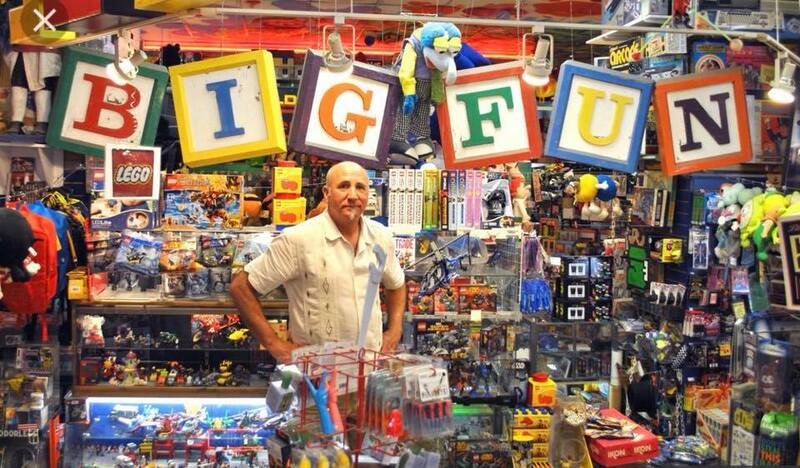 Last week, we were delivered the sad news, our friends at Big Fun will close the lid on Cleveland's favorite toy box after over 27 wonderful years in Coventry Village. We are so grateful to Steve Presser and the Big Fun staff (past and present) for the JOY they brought to their customers and the entire neighborhood! We encourage you to shop the sale and follow their Facebook for related news. This sweet letter from Tommy's Restaurant owner, Tommy Fello to his long-time friend, Steve Presser (Big Fun) was originally posted on Tommy's Restaurant Facebook Page. We were so moved reading it, we wanted to share it with you. I remember the first time I met you. I didn’t know anything about your business. You showed me four boxes of old Cleveland Press TV Guides. To me they looked like garbage. You smiled at me and said “I got these for $100!” I thought to myself, “Oh my God, Why?” You looked at me with that gleam in your eye as you held up one TV Guide with a picture of Ghoulardi on it and said proudly “ I can probably get $300 for this!” I started out as a skeptic of the collectible commodities world, however if I knew then what I know now about how much of a savant you are when it comes finding value in the overlooked, i would have never doubted you! Coventry is a very special internationally recognized business district. You and Big Fun have received well deserved international, national and local recognition based on your hard work, dedication and unique and innovative approach to business. This media attention was continually shared with all of your fellow merchants and Cleveland Heights without a second thought. That is a testament to who you are as a person and a businessman. Our local mom and pop businesses have been popular for decades but the real treasures are the shop owners. Many of them are pioneers in their industries. There are several business owners who are members of “My Coventry Village Hall of Fame.” To name a few: Bill Jones/The Leather Shop, Larry Lockhart/Cargo, Chuck Avner/Generation Gap, Marsha Polevoi/High Tide Rock Bottom, George Fitzpatrick/Heights Art Theater and Sheila Blecman/Coventry Cats. Steve, you are not only a part of this group but have epitomized the work and dedication it takes to run a small business while contributing to the growth and stability of Coventry and Cleveland Heights. To me you are number one on this list! Steve, you are everyone’s “go to guy” if we ever need to contact anyone. You are a walking, talking infocenter with a calculator for a brain. You volunteer on more non-profits than anyone else I know. It’s amazing how you continually put everyone else’s needs before your own no matter how busy you are while modeling to future generations the importance of giving back to your community. Your influence and innovation have always transcended the brick and mortar store and will continue to impact Coventry. You have influenced my life on many levels and have become my best friend and partner in crime. Don’t worry, there will always be an iced tea with honey and a well done french onion waiting for you!